STABILO point 88 Mini in pocket format. Tailored to the needs of the mobile and trend-conscious, it comes with a brilliant color selection and remarkable ink quality. Its metal-enclosed tip creates an incredibly fine 0.4mm line width, and the excellent dry-out protection without cap ensures a long lifespan. 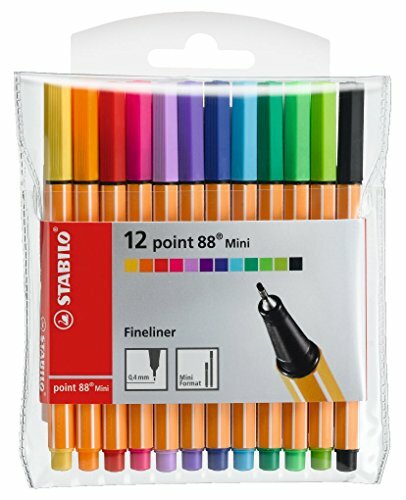 Your note-taking and underlining will become something to be desired with the STABILO point 88 Mini fineliner. MINI POCKET SIZE - Europe's number one fineliner pen in miniature pocket format, tailored to the needs of the mobile and trend-conscious. METAL ENCLOSED TIP - It has metal-enclosed tip to promote long lifespan and creates an incredibly fine 0.4mm line width. EVEN INK APPLICATION - The pen offers a robust M-tip (line width approx. 1mm) for even ink application that can be perfectly used for bold lines and large areas. ICONIC DESIGN - The pen has an iconic orange-white hexagonal striped design known all over the world. SET OF 5 DIFFERENT COLORS - The 5 different neon shades are perfect for quick notes, underlining or structuring.